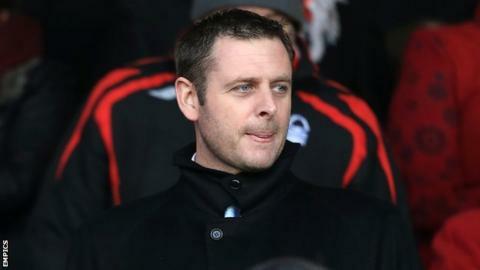 Peterborough United chairman Darragh MacAnthony has promised an "inquisition" should Posh be relegated from the Championship this season. But he said boss Darren Ferguson will not lose his job if the club fails to beat the drop. "Should we be doing a lot better? Absolutely," the Posh owner told BBC Radio Cambridgeshire. "If we don't retain our Championship status, there will be casualties. Will one be the manager? No." Peterborough survived comfortably last season following their promotion through the play-offs, but they are currently bottom of the table, four points adrift of safety. The bulk of their troubles lie in the disastrous start to the season, which included eight straight league defeats and only four wins from 21 games. MacAnthony suggested he knew why his side had been struggling, but was reluctant to expand on the reasons why. "Can I put my finger on it? I think so, yes. Will there be an inquisition into it come the end of the season? Yes, indeed," he said. "It doesn't matter [what the reasons are]. At the end of the day there will be an inquisition into why we haven't stayed as a Championship club. "Because it's been our biggest budget, our biggest squad and our biggest investment." And MacAnthony admitted that in previous seasons he would have been tempted to relieve Ferguson of his duties. "Losing 14 of our first 18 games - probably a few years ago under me he would have been sacked," he said. "I've grown up and matured. We have a stronger relationship."